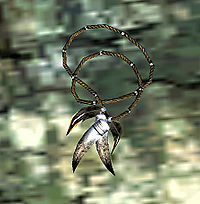 The Totem of Claw and Fang is a powerful artifact sacred to the Skaal of Solstheim. It is a totem used in religious rituals to invoke powerful nature magic. Its primary function is the summoning of a Spirit Bear, which is then tracked down and killed by the Skaal to please the All-Maker during the Ristaag, a ritualistic hunt. The Totem was stolen from the Skaal at one point. Believing that it would not again be needed, the Skaal did nothing to recover it, and it eventually came to rest in the Tombs of Skaalara on Solstheim's northeastern coastline. In 3E 427, the Skaal once again required the Totem in an effort to counteract the Bloodmoon Prophecy, and attempted to retrieve it from the tomb. Hircine wished to prevent its recovery, and sent his Hounds to guard the tomb. The werewolves were ultimately unsuccessful in guarding the Totem, and the Skaal initiated the Ristaag. 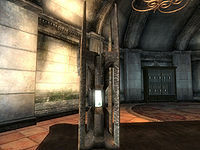 The Totem of Tiber Septim is an artifact that allows its bearer to control Numidium, the ancient Dwemer construct. It was created at the end of the Second Era by Imperial Battlemage Zurin Arctus, to allow Emperor Tiber Septim to use the golem in his conquest of Tamriel. Only an individual of noble blood or special supernatural affinity can safely wield the Totem; it will reject an unworthy owner, and has been known to telepathically do so to such individuals. The Totem was lost along with Numidium shortly after the conquest of Tamriel, when the automaton was destroyed by the Underking. It was known to have resurfaced in the Iliac Bay region some time around 3E 401. After changing hands several times over the next few years, it was recovered by a mysterious adventurer sent by Emperor Uriel Septim VII. In 3E 417, the Totem was simultaneously given to (and used by) seven factions around the Iliac Bay. This caused the phenomenon now known as the Warp in the West, during the events of which the Totem was apparently lost again. 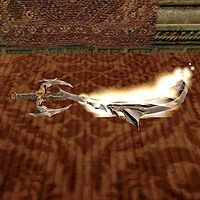 Trueflame, or the Blade of Nerevar, is a one-handed Dwemeri sword from the early First Era. Trueflame and its twin blade, Hopesfire, represented the pinnacle of Dwemer craftmanship. They were presented as wedding gifts to Lord Indoril Nerevar and Almalexia by the Dwemer King Dumac. Trueflame was shattered during the Battle of Red Mountain circa 1E 700, and the pieces were lost. In 3E 427, the Nerevarine found the pieces and reforged the blade.